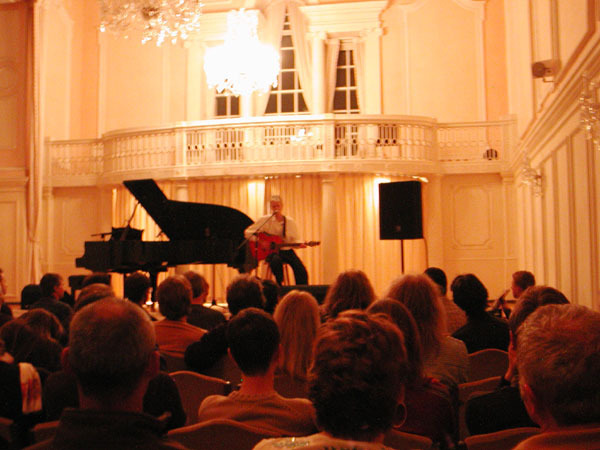 With some help from friends and Koen's gig list (see links) I have managed to come up with the following tentative list of solo concerts I attended. 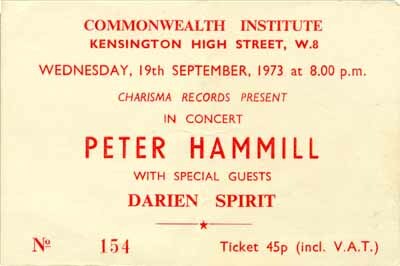 19th September 1973; Commonwealth Institute, London. - went with Tim and Twinx. 16th February 1974; London School of Economics (with Bebop Deluxe). This poster is from the same tour but advertising the Stevenage College gig. Many thanks to Pete Lee. "All my life I have accepted that synchronicity will always play a part. 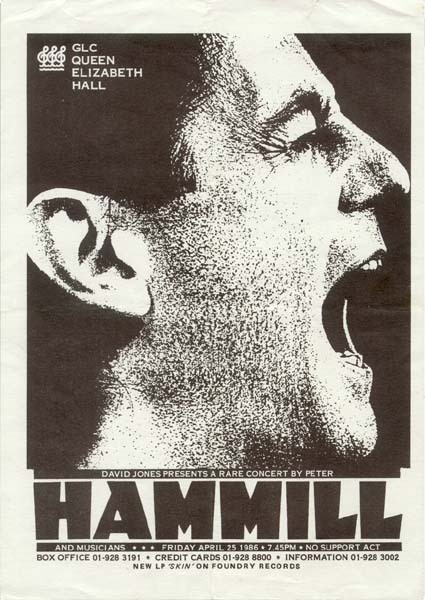 . .
Last weekend I found some Hammill CDs in HMV for £3.99 and thought I would like to reactivate my interest after some 20-odd years. I also thought I'd re-read the article in Record Collector and therefore found myself checking out the sofasound website. And hereby lies the synchronicity, as it led me to check out your website which led me to. 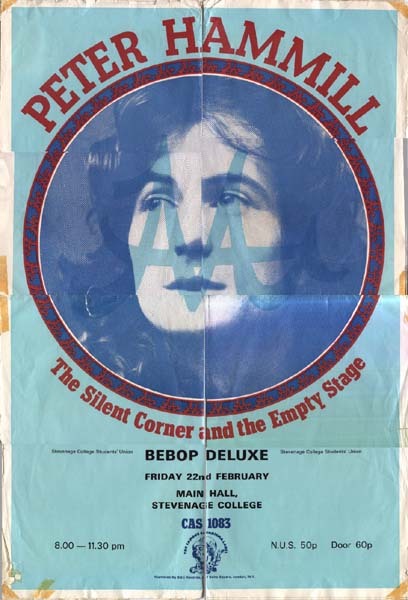 . . the poster from the Stevenage College gig in 1974. 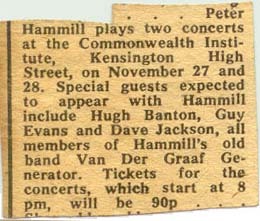 And I was the promoter of that gig (on behalf of the Student Union). 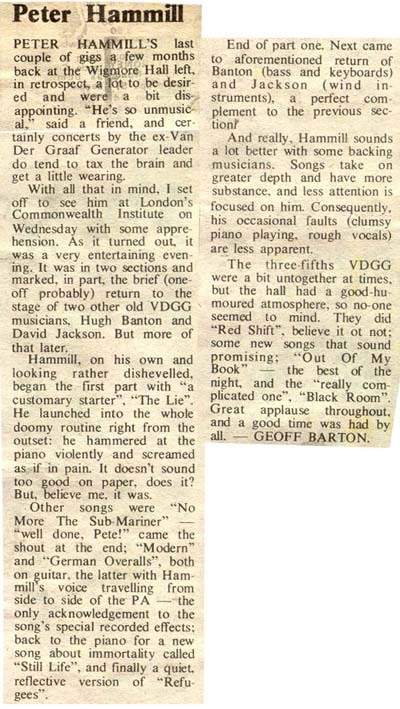 I thought you may be interested to know a little more about that gig. I was acquainted with Nigel and Paul at Charisma and they knew I was interested in PH (I used to spend a lot of time between the Marquee and the Nelly Dean). 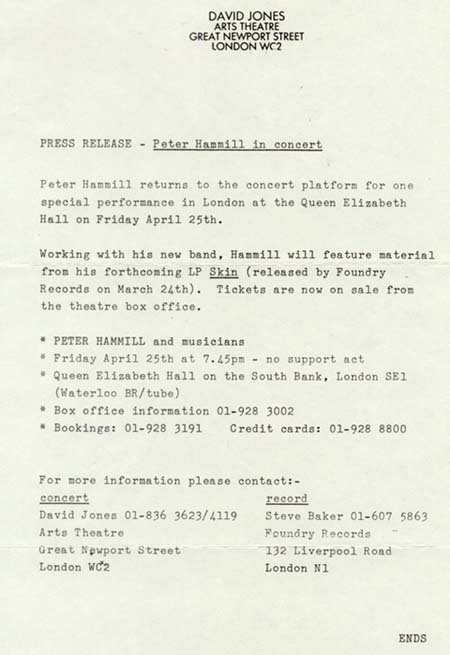 As it was an important tour, they knew I would be up for putting the gig on, which was just far enough away from London to make it worthwhile. 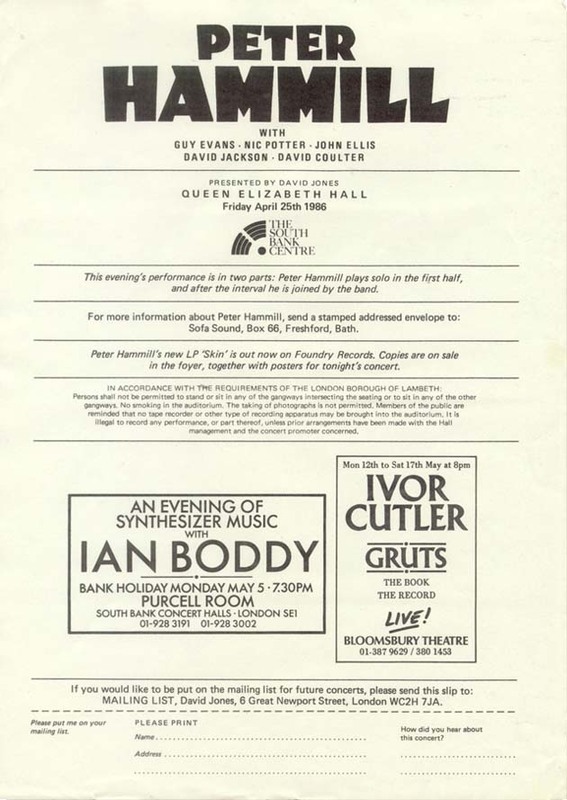 A school friend of mine, Mark Trotman, used to live next door to Peter Hammill's family in Derby and he had introduced us several years before. So at various gigs we'd spent a fair amount of time talking to him, we'd also corresponded through the post occasionally. 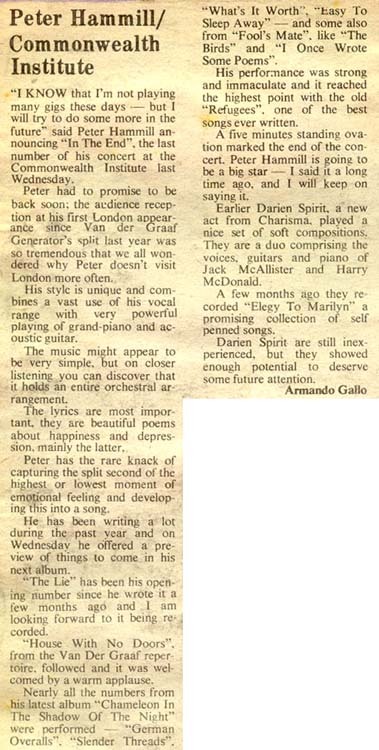 When Peter turned up at Stevenage (I'd also been at the LSE gig the week before) there was a general breaking out of alcohol as it was something of a triumph for me to get this gig put on. Another (vague) friend had spent weeks "finding" bottles of interesting alcohol at her mother's Coffee and Cheese shop (which sold exotic liqueurs as well) and we had quite a stash by the time the gig came round. Being familiar with Peter's predilection for Tequila, I had bought him a bottle of White Tequila and he had a bottle of Yellow Tequila, both of which we drank that night (on top of some disgusting Whisky Mac concoction and various Rastafarian Rollups). Consequently, Peter was quite late starting that night - Bebop Deluxe were very good (I think - through the walls of the Green Room they sounded fine). I still don't know how Peter got on stage that night as he must have been slaughtered. 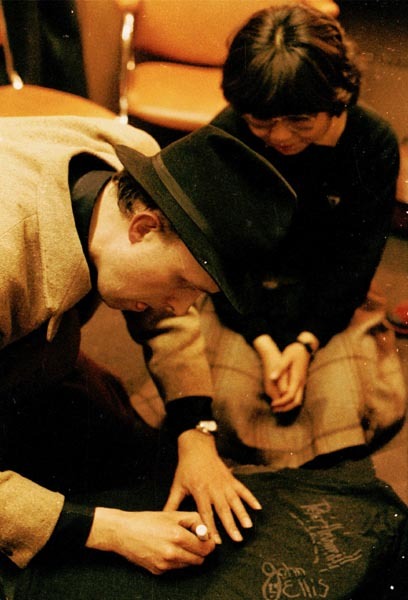 In between passing in and out of consciousness, I managed to see quite a lot of the concert and I can still vividly recall the police turning up at midnight because the Caretaker had called them in. The gig just sort of ended there and then. 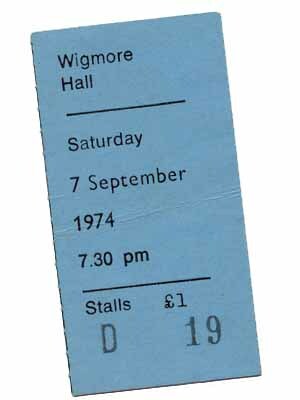 It was often the case - an Al Stewart gig was nearly cancelled half way through because someone had set fire to the curtains during Richard & Linda Thompson's set (we had some good gigs in those days!). Because of my incapacity the proposed party at my house didn't happen, but I believe the impromptu one at a friend's house was interesting. I awoke the following day needing to buy a present for a 21st Birthday Party and ended up buying a goat, but possibly the less said about that the better." 17th May 1974; Thames Polytechnic, London. This one took some figuring out but I found my diary for 1974 and can confirm the date - went with Richard and Julie. I am told by Julie that PH was somewhat late for this gig and showed up at midnight! Julie was still at school (6th form) and had a Saturday job. The gig was on a Friday night and needless to say the last trains had long gone by the time it ended. She got the first train in the morning and managed to arrive for work just in time, albeit with no sleep. Worth it though no doubt! 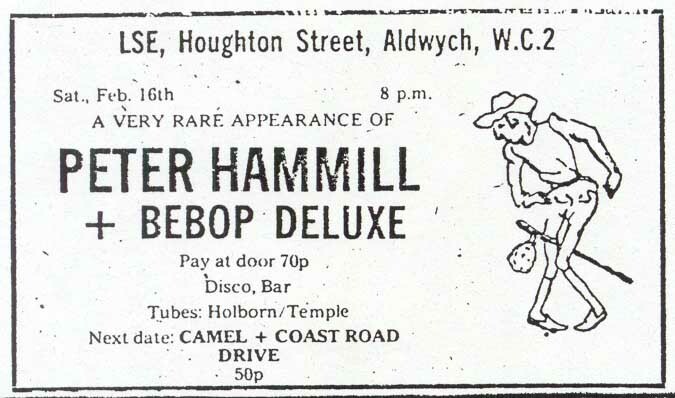 7th September 1974; Wigmore Hall, London. - went with Richard and Trevor. 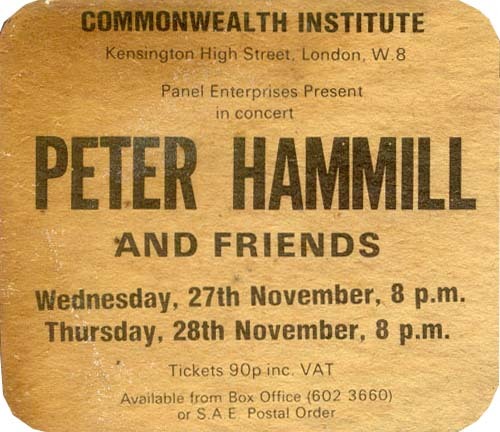 27th November 1974; Commonwealth Institute, London. 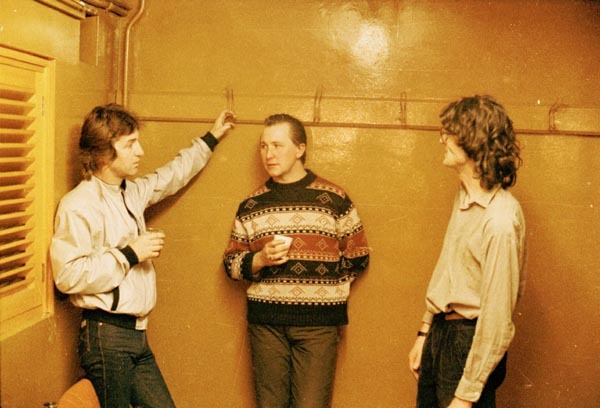 See the Van der Graaf Generator Gigs page. 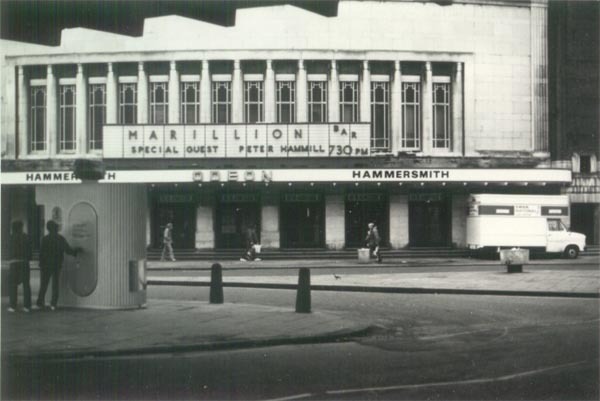 17th or 18th April 1983; Hammersmith Odeon, London (supporting Marillion). - went with Tim and Malcolm. 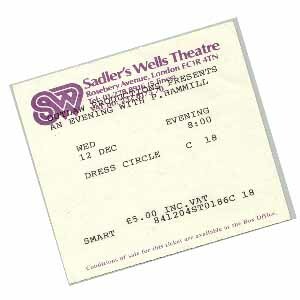 12th December 1984; Sadlers Wells Theatre, London. 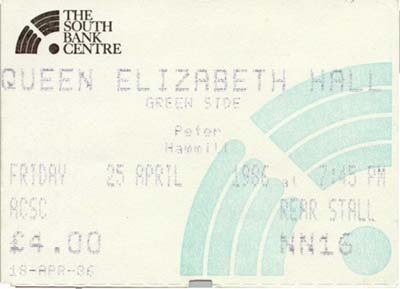 25th April 1986; Queen Elizabeth Hall, London. 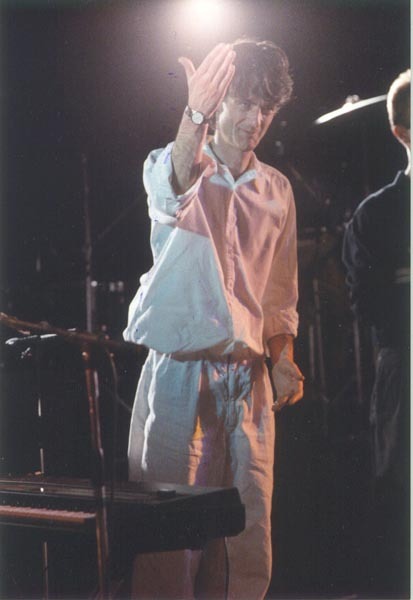 25th February 1990; Royal Festival Hall, London. - went with Alison, my wife, the first time for her. 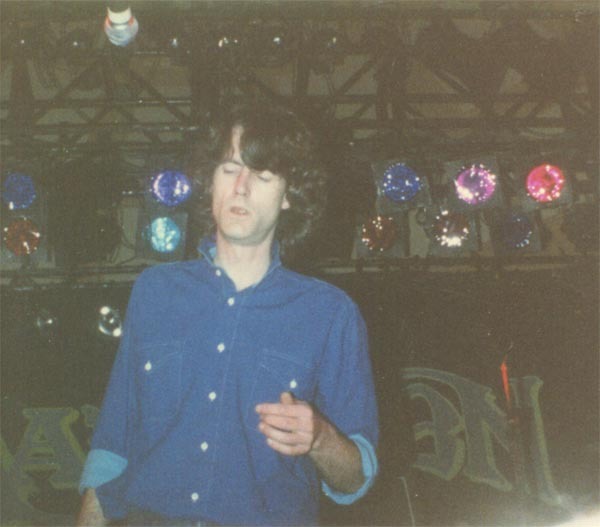 1st November 1999; House of Blues, Cambridge (Boston), Mass, USA. 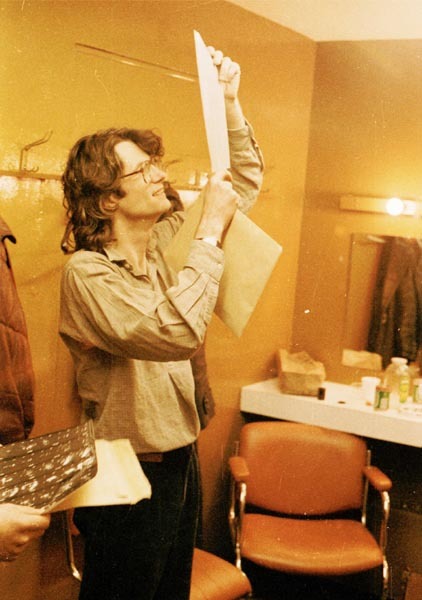 4th November 1999; The Bottom Line, New York City, USA. 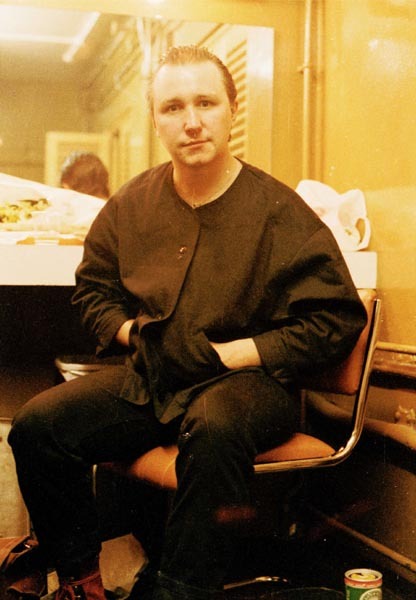 7th November 1999; The Recher Theatre, Towson, Maryland, USA. 8th October 2001; Assembly House, Norwich. - went with Tim, Pat and Alf. 19th February 2003; Huntingdon Hall, Worcester, England. - went with some of the pH7 crowd. 20th February 2003; The Stables, Milton Keynes, England. - went with Alison, Julie and Ron, Tim and Pat, Twinx, Julie T, and Alf. 21st February 2003; Queen Elizabeth Hall, London, England. - went with Jamie, Fred and some of the pH7 crowd.